I completely understand how overwhelming exams can be. I remember how I let my health suffer during the first set of exams I ever wrote at university…I would get so anxious, and full of tension. I wouldn’t eat properly and I would feel guilty for going to gym (or leaving my house for that matter). Because I am so Type A, I believed I had to study day in and day out to get the results I wanted. Interesting thing is, is that all the effort did NOT pay off! My first set of results were far from what I wanted to achieve. Why? Because I totally OVER studied! Believe me you CAN actually over-study. Sometimes when you know too much and become too focussed on the small detail, it can actually set you back because you become confused. This coupled with severe anxiety, lack of sleep and poor nutrition did not serve me well. One thing’s for sure, I certainly learned my lesson, and during my next set of exams I was able to exceed my goals because I found a good balance. So how can you find your balance during exams? Welll, its really not all that hard, I can promise you that. All you need to do is plan. I am going to share with you the very things that I did throughout my years at university to keep my mentally focussed, physically healthy and happy during exam time. I absolutely swear by these techniques because they really did work wonders for me, and I hope they do for you too. The first step is to energize your study time. Yes, it’s important to have a quiet, distraction-free place for some extended power studying, but blood flow begins to stagnate in the feet after more than 20 minutes of sitting down. To restore the blood flow to your brain, take mini-activity breaks like stretching, making yourself a snack, going to the bathroom or doing a few quick sprints outside. After a long study session your brain may feel tired, but your body needs to move. Go for a run or a bike ride, take a yoga class to calm your stress levels, try a HITT class, or walk your dog. This will renew your energy level and also help you to sleep better. On the day of the exam, be sure to engage in some moderate physical activity to warm up your body and brain for writing the exam. When you’re writing your exam, ask your supervisor if you can stand, stretch and move a little. Even a good sitting stretch is better than nothing. Relaxation tip: I would often practice this relaxation technique during a tough exam: tighten up every muscle in your body starting with your feet and moving up; then relax each muscle in the same order. Don’t forget that your brain needs healthy fuel to do its job properly. Good food = good mood. Avoid unhealthy snacks while studying and instead drink plenty of water and a small supply of fruit, veggies or nuts. It really helps to schedule regular snack breaks because this will encourage you to take some time out from studying. Short and regular breaks are essential to staying mentally alert. Opt for high protein foods, lots of green veggies, nuts, seeds, small portions of fruit and loads of water. Be sure to eat breakfast on the day of an exam. Even a small cup of yogurt or a piece of fruit helps. If you have an early exam, ask your supervisor if you can bring breakfast with you. Finally, be sure to bring a bottle of water and some healthy snacks to munch on during your exam. A banana, a handful of nuts, some pumpkin seeds or a few cucumber slices are great choices to refuel mid-exam. Just make sure your snacks are quiet, so you don’t disturb others with your crunching. Last-minute cramming is often counterproductive and can send your stress level through the roof. Managing your time well can go a long way toward reducing your stress, keeping you focussed and helping you achieve the results you want. Start by formulating your study schedule a few weeks in advance, especially when you have three or four in one week. Plan to study at times when you’re alert and able to focus. Don’t spend too much time on one subject. Try dividing your day into three parts during which you focus on different subjects. That way you will keep your brain stimulated and interested. Getting too bogged down with one subject can create boredom which in turn will block you from absorbing the information you need. Focus on your tougher subjects when you are most alert. For some this may be early mornings, and for others this may be in the evenings. Leave your easier subjects for the afternoon. Have a family member or friend ask you questions. Create a study group so that you can make your studying social and conversational. It is a huge advantage to have insight from others when learning. Hearing the interpretations of different topics from your peers may help you better understand certain sections you have struggled with and may also shed new light on topics you already know well. Be interactive with your study material. Don’t just read and hope for the best. Ask yourself questions, request past papers from your lecturer, explain the material you have learned to a friend or parent. Apply real world examples to your study material. In so doing this is when true learning and understanding takes place. Don’t forget to consider your personal sleep needs. It doesn’t work to deprive your body of sleep in favour of more study time. Instead, stick to your study schedule and get plenty of rest. Exam time is likely to increase your stress level. Some of that is good stress that helps you focus on the task at hand. The important thing is to manage your stress. 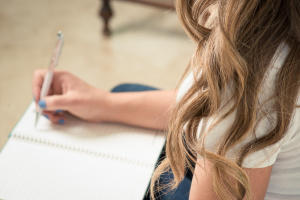 With planning and preparation, you can reduce your exam stress and make it a positive thing. Try some of the tips above and remember to feed your mind, exercise your body and manage your time.